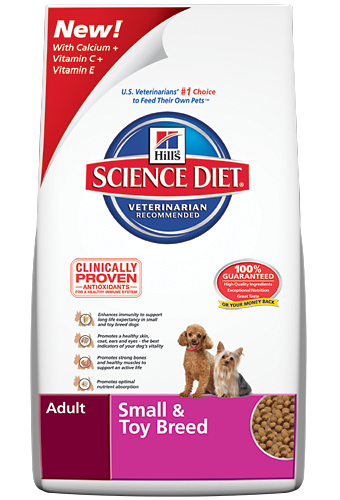 *Provides precisely balanced nutrition to meet your small breed dog's special needs. *Contains high levels of antioxidants to help build a healthy immune system with ideal levels of vital fatty acids to promote healthy skin, coat, ears and eyes. *Contains high quality proteins and calcium to promote strong muscles and bones. Whole Grain Corn, Chicken By-Product Meal, Soybean Meal, Pork Fat (preserved with mixed tocopherols and citric acid), Flaxseed, Chicken Liver Flavor, Lactic Acid, Dried Egg Product, Dried Carrots, Dried Spinach, Dried Grape Pomace, Dried Tomato Pomace, Dried Citrus Pulp, Soybean Oil, Vitamin E Supplement, Iodized Salt, Oat Fiber, Choline Chloride, vitamins (L-Ascorbyl-2-Polyphosphate (source of Vitamin C), Vitamin E Supplement, Niacin, Thiamine Mononitrate, Vitamin A Supplement, Calcium Pantothenate, Biotin, Vitamin B12 Supplement, Pyridoxine Hydrochloride, Riboflavin, Folic Acid, Vitamin D3 Supplement), Potassium Chloride, Taurine, minerals (Ferrous Sulfate, Zinc Oxide, Copper Sulfate, Manganous Oxide, Calcium Iodate, Sodium Selenite), L-Carnitine, Alpha-Lipoic Acid, preserved with Mixed Tocopherols and Citric Acid, Phosphoric Acid, Beta-Carotene, Rosemary Extract.